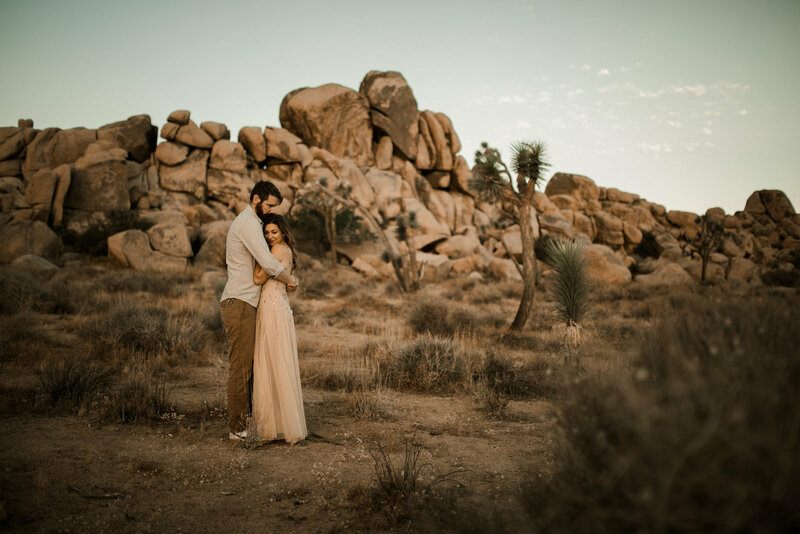 When Caitlin and Alden told me they wanted to take their engagement photos in Joshua Tree National Park I could not contain my excitement. One shooting in the desert is one of my favorite settings to shoot in. Two it has been one of my goals to visit every National Park. Caitlin and I had been texting for a few months prior to the shoot planning out the details. They rented the best little Airbnb for their stay. They invited me to stay with them at the Joshua Tree house since we would be shooting all evening and at sunrise the next day. When I first met Caitlin and Alden in person it was at this little restaurant in town. We visited for a few minutes and grabbed a quick bite to eat. Since we had been texting and emailing before meeting up we didn’t have to waste time with small talk. I instantly felt connected to them. We drove for about 15 minutes on some dusty back roads until we arrived at the casita. Every detail of this house was perfect. It was made to be photographed. The tinniest details from the plants to the rugs to record player and macrame hanging above the bed. We started with some drinks. A beer for Alden and Caitlin had her goat wine. Every area from the inside out was photographed. Once it started to cool off we made our way to the patio which had the comfiest lounge chairs and hammock. We explored all around hiked up some boulders to get the best views. When it was too dark to shoot any more we practiced taking pictures of the stars. I couldn’t believe how well you could see them. After spending hours outside star gazing we crawled in to bed. Morning came way too soon. It was so peaceful and quite that morning and luckily it wasn’t 100 degrees yet. Caitlin had on a stunning dress from Free People she has the best style and it complimented the desert so perfect. Before we knew it the sun was baking us so we headed back to town and grabbed some breakfast before we all had to leave that morning. Caitlin and Alden are some of the greatest people I know. I am so grateful to have been able to spend a weekend with them in Joshua Tree National Park forming friendships and memories. Video from our session is right here.